Our last weekend in Cuzco we took a bus to Pisac, a town in the Sacred Valley of the Incas famed for its Sunday market. We had seen the town a week earlier from a very different vantage point, looking down across the river while trekking on the way to Huchuy Cusquo. The plan was simple: bus the hour or so from Cuzco to Pisac, drop our bags at a hotel, and take a taxi to the top of the ruins for a leisurely walk down. It didn't quite work out that way. Even though we'd been in the highlands for weeks, the rickety-swerving bus managed to make us motion sick, and by the time we'd rested, eaten and managed to find Hospidaje Kinsa Ccocha, it was getting towards late afternoon. Negotiations with a taxi took a bit more time, as did buying our ticket, and we reached the summit with only a few hours of light left. A few hours later, we were making our way down in the dark. We haven't blogged much about our various visits to Incan ruins. Built primarily with corv�e labour, these enormous constructions of stone are all that remain of the great Incan cities after centuries of Spanish conquest, extensive robbery of antiquities and the unrelenting passage of time. While neither as spectacular in architecture as Huchuy Cusquo, nor as famous as Macchu Pichu, the ruins of the Incan citadel are well worth the hike downhill. Continue reading Pisac: A Walk in the Dark (Peru, September 18-19, 2010). A good deal of law, American or otherwise, concerns separation and division: partnerships dissolve and assets must be allocated, or marriages end in divorce and property must be divided. Modern American law has any number of mechanisms for the allocation of property between disputing parties. The latter day descendants of the Uros people, who live (more or less) on Lake Titicaca, have developed a unique method of dealing with intra-clan disputes. 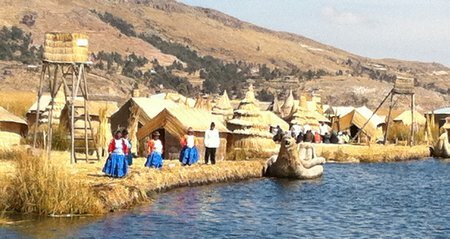 The Uros constructed a network of artificial floating islands on the part of the lake near modern-day Puno, building reed huts atop a base of more reed and clay. The island that we visited measured approximately seventy by thirty feet and held about six reed huts and as many families. Our guide described the Uros method of dispute resolution. If the clan living on the island found itself unable to resolve its internal differences, the clan would shift the huts of contending parties to opposite sides of the island, and then the clansmen would use a very large saw to cut the island itself in two. Both sides were then free to drift away from each other and start anew. As mediation goes, I suppose it does cut down on legal fees. Continue reading Equitable division of real property, Uros culture, and Lake Titicaca (September 14-16, 2010). The U.S. Embassy wishes to alert U.S. citizens residing and traveling in and around Cusco, Peru of possible travel difficulties due to strikes and political demonstrations in the weeks prior to the upcoming October 3 municipal elections. The Peru Rail tourism train between Cusco and Machu Picchu will be closed Tuesday September 21 and Wednesday 22 due to transportation strikes. Travelers should be aware of possible impediments or delays to their travel in this region, particularly in the lead up to the October 3 elections, and remain flexible in their plans. It would have been nice to get this earlier than 8:47am on Sept. 21, when Tony and I already had reached the airport, but probably the U.S. Embassy doesn't get much more notice of these things than the rest of us. However, once we reached Lima, we had a different kind of disruption: on our first night, around 3am, we woke up due to an earthquake tremor. It wasn't particularly noteworthy -- a mere 5.9 even at its epicenter 110 miles away from Lima -- and I wouldn't mention it except it ended my pattern of earthquake avoidance on this trip. Consider: an earthquake shook central Canada just a few days before we crossed the northern border. A tremor passed through the D.C. area the day before I arrived for a friend's wedding in Northern Virginia. Both were extremely unusual for the areas in which they occurred. As we'll be passing through several more earthquake-prone areas after Peru, hopefully all future tremors will be as negligible as the one we felt in Lima. I woke up, but quickly fell asleep again, and in the morning vaguely thought I'd had a dream about an earthquake, until the owner of the hostel asked me if I'd felt it. It looks like Tuesday morning was a great time to leave Cuzco, as we got out just before strikes and protests paralyzed the city. Although we had a very hard time catching a cab to the airport, and were a bit confused as to why there was such a strong police presence apparent during the journey, we made it to our flight, and to Lima, without incident. I'm really excited about the election. 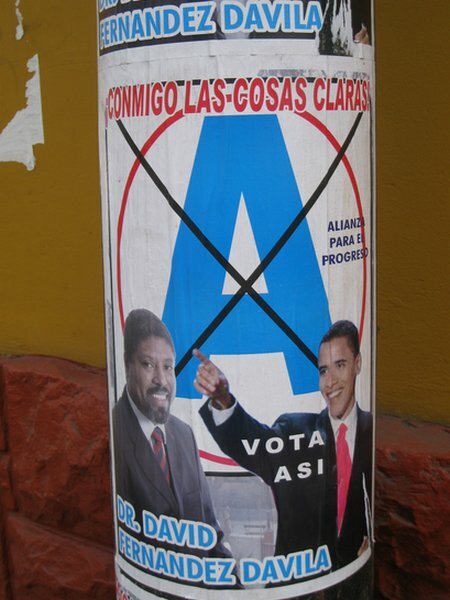 Not the American election (which I'm not talking about on this blog, unless sudden upsets become relevant to our travels), but the Peruvian elections coming up this fall. For sheer enjoyment of the political process, nothing beats a country in which you don't speak the language, don't understand the process, and don't have a stake in the outcome. It's all the fun of parades, crazy guys shouting through loudspeakers while perched precariously on the back of trucks, and omnipresent political advertising, without an investment in the outcome or the stress of civic duty. I have no idea which party is which, or their positions. What I do know is their symbols, which are very important. While traveling through Peru, we've met people who speak one or more of Spanish, Quechua, or Aymara, and I'm sure there are other tongues. Moreover, about 7% of Peruvians can't read, according to Wikipedia. Presumably for this reason, every party political sign includes the party symbol with an X over it, illustrating how supporters should vote. Thus, to go only by the pictures, Peru's political parties include, among others, the Condor Party, the My Logo Looks Like the O in Vodaphone Party, the Soccer Ball Party (I could make out that they're for more spending on sports and education), the Wheat Party, the Pan Pipe Party, the Incan Profile Party, and my personal favorite, Pan: the Bread Party. Their symbol is a loaf of bread, and depending upon the size of the wall bearing the advertisement, the logo either looks like a dinner roll or enough bread to feed a family of eight for a fortnight. Sometimes the loaf is framed by the outline of a mountain. Pan's ads are cheery, brightly colored in greens and reds (except for the bread, which is the color you would expect), and I like them for their simplicity. Again, for all I know they're the party furthest away from my own politics, but I base my fondness solely upon their branding. It's a little liberating to chose your political support based on wholly senseless reasons. However, if I were a nationalized Peruvian voting for the first time, I think I would find democracy itself a disappointment, at least after I'd read the instructions helpfully provided by ONPE, the Peruvian agency responsible for voter education. ONPE's posters, explaining how to vote, were posted in most of the town squares, and as public service posters go, they were concise, direct and beat the heck out of anything you see at the post office. (Look at it this way: I could understand them with my limited Spanish. Imagine reading voter education signs in New York if your first language weren't English.) However, the sample ballot on the signs had even better political parties: the Pumpkin Party, the Internet Party (symbol: @, of course), and the Fudgesicle Party, among a dozen others. After that, Bread and Condors (let alone elephants and donkeys--how boring are we?) just can't compete. 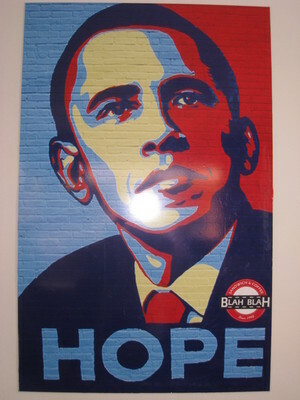 We asked one of our guides whether candidates were required to paint over these ads after the election, and he told us that while they were supposed to do so, they often did not. On the other hand, one mayoral candidate took advantage of this, with posters and banners proclaiming (roughly translated) "[Candidate] believes that we should keep Puno beautiful, so he doesn't paint ads on the walls." This caused us a few seconds of cultural confusion. Because the symbol was covered by an "X," we originally thought that these were somehow negative ads: "Don't vote for the Bread Party," etc. In actual fact, I've not seen a negative ad yet, which is perhaps aided by the multitude of political parties. Maybe it's easier to go positive for yourself than to trash a dozen other factions. Or maybe negative ads have been banned. I don't know. We already knew that if we were going to charge anything in South America, the Capital One card was the way to go. They have good exchange rates and no foreign transaction fees. (Seriously, if you're doing overseas travel, CO beats AMEX , BoA, or Chase hands down.) But credit cards are the least of one's payment problems in Ecuador and Peru. For the most part, establishments are loath to take your plastic, and will frequently charge you a heavy fee for the convenience. While you're down here, cash is king. Which had been a problem, because we were getting killed by ATM fees: about 10 soles or $3 per ATM transaction. Which puts one in a bind: do you pull out the maximum amount of cash and become an instant mugging target, or do you pile up the fees? Hey, How I Met Your Mother may like to make fun of Canadians, but at least they have civilized cash machines! 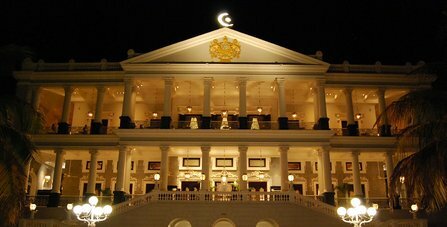 Which does, however, have a pretty good platinum concierge service, although it's more likely to get a good result if you ask it a question about stateside services. I'm not sure if anyone has ever bothered to make it official, but it becomes obvious after ten minutes in about any Peruvian bar that pisco is the national spirit of Peru. Visitors will most likely first encounter the spirit in the pisco sour, which again, if not actually the national cocktail, appears on menus with sufficient ubiquity that one could be forgiven for thinking that it is. Unfortunately, the sticky sweetness of the pisco sour and its whipped-egg consistency do not appeal to me. Quebranta and aromatic piscos on their own, give me a sharp, strongly alcoholic taste, like a dry brandy. We've tried a few pisco drinks while in Cuzco, but my favorite so far is the Capitan, served to me last night by the bartenders at Chi Cha. Besides being an excellent restaurant (and I suspect that Pallavi will write more about this), Chi Cha boasts some of the friendliest bartenders that we have encountered in South America. They managed to overcome my poor-to-nonexistent Spanish and conversed with me, at length, about the various local ingredients to be found in their cocktails. They also gave me a quick primer on pisco (which admittedly I had to supplement later with some online research). Better than that, they shared with me the Chi Cha recipe for the Capitan (which is slightly different from some I've seen online). It's essentially a pisco-based Manhattan, but with the taste of vermouth coming through more clearly. Not a drink for those deeply opposed to Cinzano (you know who you are), but one that I think I'm adding to my list of favorites. Combine pisco and vermouth in a shaker with ice. Pour into cocktail glass. Twist orange peel into glass, coat rim. Garnish with a twist of lime. About the only cocktail in this genus that I occasionally drink is the White Lady, and I admit that this may only be due to my fondness for the American Bar at the Savoy. In any event, a proper White Lady doesn't have egg white. I think a dash of bitters would also work here, if you're not feeling like professional-grade cocktail-making. Sitting in a Peruvian bar, hearing Tom's Diner (the dance mix, of course), and realizing that it pretty exactly describes a lazy Sunday morning at Columbia, dodging work. As I've mentioned before, I needed some new shoes by the time I got to Peru. Not expecting to do much in the way of nice dining, I had brought only my boots, some bright yellow running shoes, and my four-year-old sandals. After Galapagos, those sandals were on their last legs, and I couldn't clean or repair them any further. Given my other options, I thought a cheapish pair of leather slip-ons (casual enough for every day, and that might serve in a nice restaurant) were in order. The only problem: neither Ecuador or Peru are particularly good places to find shoes for large feet. Continue reading No Country for Tall Men. We arrived at Lima's airport late on the night of August 30 and stayed at Hostal El Patio, a charming and not-uncomfortable little place. They let us arrive very late (after midnight), picked us up from the airport, and were clean and quiet enough for the first night. The next two nights were spent in luxury at a Doubletree, enjoying a soft bed and splurging a bit. My parents had saved up some Hilton points, and offered them to us as an anniversary gift, without which this would have been impossible. (Thanks!) This hotel was willing to accept post on our behalf, which solved one issue for us. We did not really see much of Lima in the first three days. Knowing that we had two days of comfort and safety at the Doubletree, we had not planned much in advance. Also, a month of Ecuador had run down our supplies: my old sandals were pretty much destroyed, a few shirts had seen their last days of service following shrinkage in a hostel launderia... in short, sightseeing took second-fiddle to shopping, answering long-overdue email, and generally preparing for Cuzco. We did wander around the Miraflores district, mostly a "gringo" area full of shopping, food, and nightlife. Although not exactly what some would call an "authentic cultural experience," I find that every so often I need to sit in a business district just relaxing and catching up with the world. 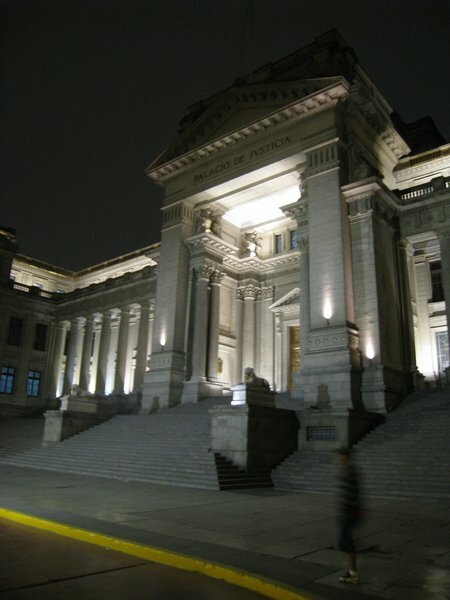 The plan is to actually do Lima on the way back, as we have to fly out of there on the way to Buenos Aires. On the other hand, we did waste some time talking to travel agents. Note to future Peruvian travellers: LAN has two prices for domestic flights, one for Peruvians and the other for foreigners. There are, reputedly, some ways around this, and the woman at the LAN ticket desk did not seem to want to charge us the foreigner price. But Peruvian Airlines and Star Peru, the two low-cost airlines flying to Cuzco, won out. 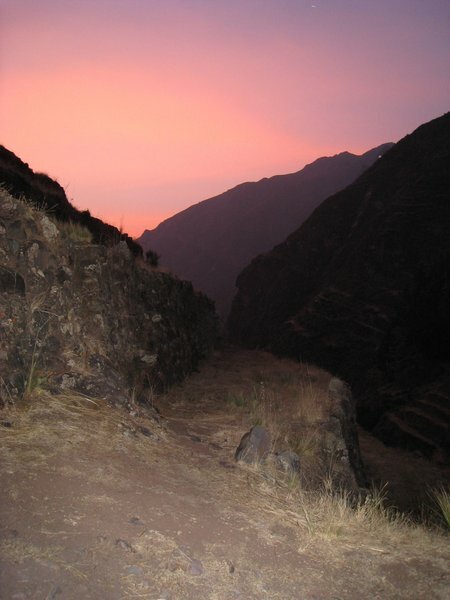 Which led us to the ancient city of the Incas in the morning of September 3... more about which later.